Ms. Watson is the President and Managing Shareholder of the Firm. 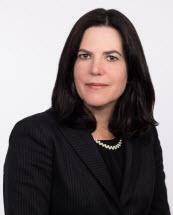 She has been litigating asbestos matters since 1999, and joined our firm in 2000. She handles general insurance defense, asbestos and toxic tort litigation, products liability and premises liability matters. She is part of the National Coordinating Counsel Team for a supplier of asbestos- containing products and in her role she oversees all aspects of those matters . Due to the strong profile she has developed in the asbestos litigation community, Ms. Watson serves on the sub-committee for asbestos cases that manages all cases pending in Western Pennsylvania and determines the expert witnesses to be retained by the joint defense group. She also serves on the defense liaison committee that regularly meets with the judges handling the asbestos docket to discuss amendments to the case management order. Ms. Watson regularly defends suppliers, equipment manufacturers, contractors and employers in asbestos related matters in Pennsylvania. She oversees all cases handled by our Pittsburgh office, as well as handling all negotiations on behalf of our clients there. In addition to her trial experience, she is actively involved in working with insurers and clients to determine baseline discovery to be used nationally in the defense of asbestos related lawsuits. She has an active trial docket and has tried several asbestos cases to verdict in Allegheny County.